My favourite fish is featured in the fantastic Pixar film Finding Nemo, released back in 2003. If you haven’t seen the movie, or need reminding, take a look at the trailer and see if you can guess which it is. No prizes for guessing that it was the anglerfish. And it really does look as scary as that. Here is a fantastic picture of one (Chaenophryne longiceps) taken by Steve Haddock from the Monterey Bay Aquarium Research Institute. The anglerfish are named (obviously) after the long movable filament that grows from their head and acts as a lure for catching prey. The lure ends in a fleshy growth called the esca, which can be wiggled and therefore acts as bait to lure other predators close enough for the anglerfish to devour them whole. 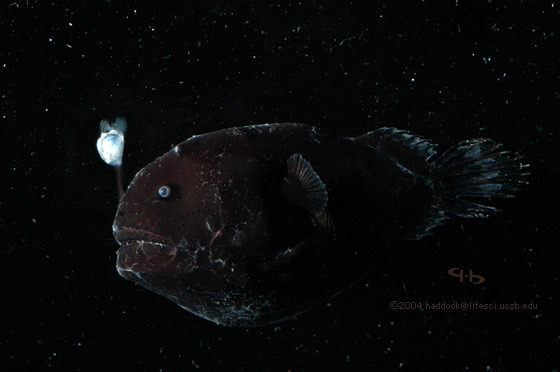 Those anglerfish that live in the dark depths of the ocean culture a population of bioluminescent bacteria in their esca. 1. Many of them are smaller than they look, just a few centimetres in length. Saying that, the font of all knowledge that is Wikipedia, says that females of the largest species, the KrÃ¸yer’s deep sea anglerfish (Ceratias holboelli) reach 1.2 metres (3.9 ft) in length. 2. Some species have a very unusual way of mating. The males, who are significantly smaller than the females, have a very good sense of smell, and their sole purpose it to find and mate with a female. When he finds a female, he bites into her skin, and releases an enzyme that digests the skin of his mouth and her body, fusing them together. The male then slowly atrophies, first losing his digestive organs, then his brain, heart, and eyes, and ends as nothing more than a pair of gonads, which release sperm in response to hormones in the female’s bloodstream indicating egg release. A single female can have more than one male fused. There is a fantastic cartoon of this here. So there you have it. My favourite fish. Pixar Animation pioneered the use of wavelets mathematical techniques in the 1990s in the production of animated movies. So, there’s no doubt that every animated movie we see today, does use wavelets because of its superiority in its rendering capability. Images edges are clearly defined. yeah, I’ve known a few guys like that.